"Today" Show Goes Viral with "Feeling"
Brian Williams got in on it. Who knew working at 30 Rock was this much fun? The "Today" Show took office sing-a-longs to new heights Friday with their rendition of the Black Eyed Peas' song "I've Got a Feeling" featuring the entire cast and crew -- all wearing t-shirts with their job titles. 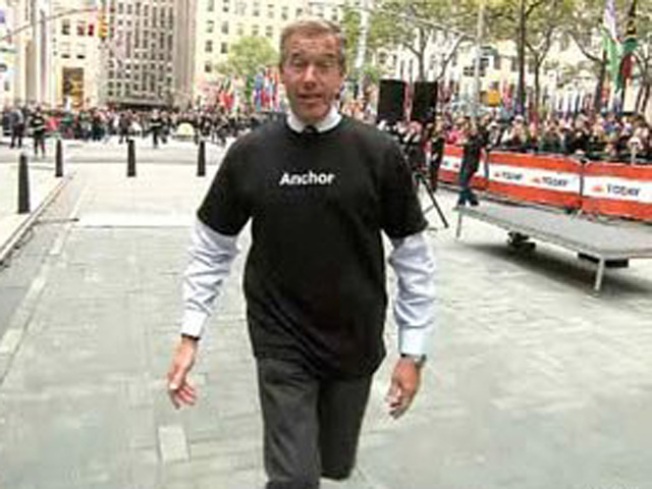 Even Nightly's Brian Williams got in on the action. "Today" senior broadcast producer Don Nash (the one on the unicycle) and producer Jen Long were the brains behind the viral vid, executive producer Jim Bell told PopEater. "Jen worked on it with a team and mapped out all of the choreography," Bell said. "The anchors were flawless, but Kathie Lee and Hoda seemed to enjoy doing multiple takes when it came to their part 'Fill up my cup ... Drink ...Mazel Tov."